Everyone has different tastes and favorite recipes so if I call something the very best of its kind you better be sure I mean it. This shrimp cocktail has earned that title. This is beyond a doubt the best Shrimp Cocktail Recipe I have ever tasted. The sauce is incredibly flavorful with a perfect balance of spicy tangy heat. I have made this shrimp cocktail twice now. Initially, I halved the recipe to test for lunch. Even though it was just my kids and I we inhaled every last bite of this perfect shrimp and sauce in a matter of minutes. Because we didn’t leave a single shrimp for the other adult in the house to taste, I felt obligated to make it again–just to make sure it was as awesome as I remembered. And yes, it was every bit as delicious the second time. I’ve made this recipe with both medium size shrimp and jumbo shrimp. I preferred the jumbo ones, but the smaller ones tasted every bit as amazing. In the future when I make this, I’ll likely buy whichever is on sale at the time. I’ve also boiled the shrimp with and without their shells and tails. Whichever method you prefer will work fine. There is no difference in the taste. I love that Shrimp Cocktail is a quick dish with tons of flavor. From start to finish, this recipe takes just over 20 minutes AND it can be made in advance and stored in the fridge to make getting a quick meal on the table even easier. Are you ready to try the Best Shrimp Cocktail Recipe ever yet? Most of us have encountered shrimp cocktail at one time or another, whether as an h’ors devours at a party, an appetizer at a restaurant or laid out on a buffet table. 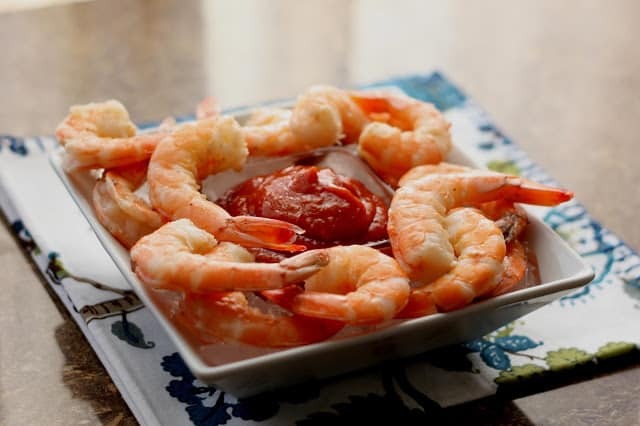 It’s a simple dish of cooked shrimp served with a dipping sauce made from ketchup and horseradish. The most labor intensive part of cooking shrimp for shrimp cocktail is shelling and deveining your shrimp. Thankfully, it’s easy to find shelled and deveined shrimp at many markets and grocery stores with a decent seafood selection. If you can’t find deveined shrimp, it’s not too difficult to remove the vein yourself. Simply shell the shrimp (leaving the tail intact) and cut through the top of the shrimp along the vein line and remove and discard the vein. Once prepared, the shrimp go into a pot of salted water along with thyme, peppercorns, celery seeds and bay leaves. The shrimp will absorb the flavor of the seasonings as they cook on medium high heat for a few minutes. When the shrimp have just started to turn pink, you remove the pot from heat and add a heaping of lemon juice along with the peels of two lemons. The shrimp will continue to cook in the hot water, taking on all that tart and zesty lemon flavor. The shrimp are finished cooking when they turn bright pink. To keep the shrimp from overcooking, simply add 8 cups of ice to the pot of shrimp right at the end and let them cool completely. Use a slotted spoon to fish the shrimp out of the pot and store them in the refrigerator until it’s time to serve your shrimp cocktail. A good dipping sauce is integral to making the a delicious Shrimp Cocktail Recipe that stands out from the rest. To make Shrimp Cocktail Sauce, whisk together ketchup, horseradish, lemon juice, cayenne pepper, Worcestershire sauce and a dash of Old Bay seasoning. Chill the sauce until you’re ready to serve. It’s not too sweet and not too tart–just the right blend of both with a tiny kick of spice. Both the shrimp and the sauce can be prepared up to 24 hours in advance and stored in the fridge. Serve your shrimp cocktail the traditional way in a large stemmed cocktail glass or serve the shrimp on a plate with the dipping sauce in the center. However you choose to serve your shrimp cocktail it’s guaranteed to disappear in a hurry! On the Hunt for more great Shrimp Recipes?Check out these Bacon Wrapped Shrimp Kabobs next time you’re in the mood for a delicious seafood appetizer. For a tasty and easy lunch I love serving Bacon, Bleu Cheese, and Shrimp Chopped Salad. Shrimp also makes its way to my dinner table fairly frequently in the form of this kid-approved Kielbasa and Shrimp Fried Rice, Sweet and Spicy Pineapple Shrimp Stir-Fry and one of our all-time favorites, Spicy Orange Garlic Shrimp. I’m also planning to give Shrimp Cocktail Wonton Cups from A Spicy Perspective and this Hot Shrimp Cocktail Dip a try for a little something different. What’s your favorite way to cook and serve shrimp? In a large pot, combine the shrimp, 4 cups cold water, salt, thyme, peppercorns, bay leaves and celery seeds. Cook this mixture over medium-high heat, stirring occasionally, until the water registers 170 degrees and the shrimp are just barely beginning to turn pink, about 5-7 minutes. Remove the pot from the heat and add 1/4 cup of fresh lemon juice, along with all of the lemon peels. Cover the pot and let the shrimp mixture rest until the shrimp are completely pink and firm, about 5-7 minutes. While the shrimp finishes cooking, set aside 8 cups of ice next to the pot. When the shrimp are bright pink, stir the ice into the pot and let the shrimp cool completely, about 5 minutes. Remove the cool shrimp from the pot and refrigerate until ready to serve. Whisk together the cocktail sauce ingredients and chill in the refrigerator until ready to serve. Enjoy! I've never started shrimp in cold water and steeped at such a low temp so this method intrigues me as do the things you cooked them in. I have a seafood-a-thon planned for this week and will definitely give this a try. When you say cold water does that mean out of the tap temperature? Yes, it was cold water out of the tap. I hope you like this as much as we did! My sister's birthday is coming up and I do believe this would be the perfect party app! Well, if you say it's the best, then I definitely have to try it! Horseradish is one of my favorite flavors! This brings back memories for me. I used to eat fresh shrimp with a neighbor from time to time. Her husband would drive to Mobile Alabama and buy 50 pounds of fresh shrimp right off the boats. He would drive it back home to Tennessee and we would boil it up and open a few (or more) cold beers. Those were some great afternoons! 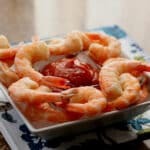 Love the recipe - I'll watch for shrimp to be on sale and give this a try. That last shot is just shrimp cocktail perfection! uuhhhmmmmm.. yea... I've made a few of your "best" recipes... I'm gonna believe you when you say this is the BEST! And of course, I will be trying this soon!! I'm obsessed with horseradish. I haven't had shrimp cocktail in so long! A few weeks ago we were driving home to Los Angeles from Las Vegas….I was playing on my cell phone and stumbled on a unique way of preparing Shrimps for a Shrimp cocktail….it was your blog that I was led to, and I bookmarked the recipe you shared, as well as delving into your site itself. I remembered this yesterday as I found the recipe in my bookmarks to serve ourselves and guests last night. Well let me tell you... STUNNINGLY delicious Shrimps like I've never cooked before….and this 57 year old has tried many, many variations on how to prepare Shrimps with succulence versus rubbery flavorless outcome. After preparing the Shrimps I had to laugh. My first email to you was me not being clear on the type of coconut for those Almond Joys, because the recipe didn't say…and now I'm writing to tell you that even though the Shrimp recipe left no possible room for error, I did not read it correctly, and I ended up making a mistake….a mistake that I will do on purpose from now on! I purchased my Shrimps at Costco. They are deveined already, and with a fairly deep incision that goes down the entire back of each Shrimp. I mis-read the recipe and placed the Shrimps into the seasoned water without having removed the shells. Because of the deep incision which exposed a goodly amount of the Shrimp meat, I feel that the flavors in the water were absolutely able to permeate….but I think that additional flavor came from the shells themselves, and again this was the best method ever (and the only method from now on) to cook Shrimps in my house! Cheers and thanks so much for having shared that recipe. 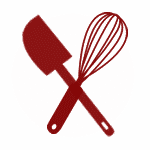 I'm looking forward to try recipes from your site that I vibe with. Recipe sounds wonderful. QUESTION: I can't do horseradish (makes my tongue swell). What do you suggest as a replacement? Would a little Tabasco be in order? There is NO replacement for HORSERADISH !!!!!!! One of the great recipe with shrimp I have found on the web. Really looks deliciuos. I need to try this at home today.Thanks for sharing an awesome recipe. Unbelievable, simple but the very best shrimp ever! I made this for Thanksgiving and everyone loved it. So my husband and I hosted a Christmas part last night and tried your recipe. The last several times I have made shrimp cocktail, I was so disappointed by either overcooking or lack of flavor.. You are right, this was by far the BEST shrimp cocktail I have ever had.. restaurant or home party!! ALL of my guests were raving!! I am soo glad I took the time to try something new.. I will never cook shrimp any other way for shrimp cocktail. Plus it was beautiful.. I served it in a glass bowl, used extra large shrimp and left the thyme sprigs and peppercorns with the shrimp, looked fabulous! Thank You! !